What is the True Cost of Electricity? WASHINGTON – Today, the Institute for Energy Research released a first-of-its-kind study calculating the levelized cost of electricity from existing generation sources. Our study shows that on average, electricity from new wind resources is nearly four times more expensive than from existing nuclear and nearly three times more expensive than from existing coal. These are dramatic increases in the cost of generating electricity. This means that the premature closures of existing plants will unavoidably increase electricity rates for American families. Almost all measures of the cost of electricity only assess building new plants–until now. Using data from the Energy Information Administration and the Federal Energy Regulatory Commission, we offer useful comparison between existing plants and new plants. America’s electricity generation landscape is rapidly changing. Federal and state policies threaten to shutter more than 111 GW of existing coal and nuclear generation, while large amounts of renewables, such as wind, are forced on the grid. To understand the impacts of these policies, it is critical to understand the cost difference between existing and new sources of generation. This study was conducted by Tom Stacy, a former member of the ASME Energy Policy Committee, and George Taylor, PhD, the director of Palmetto Energy Research. 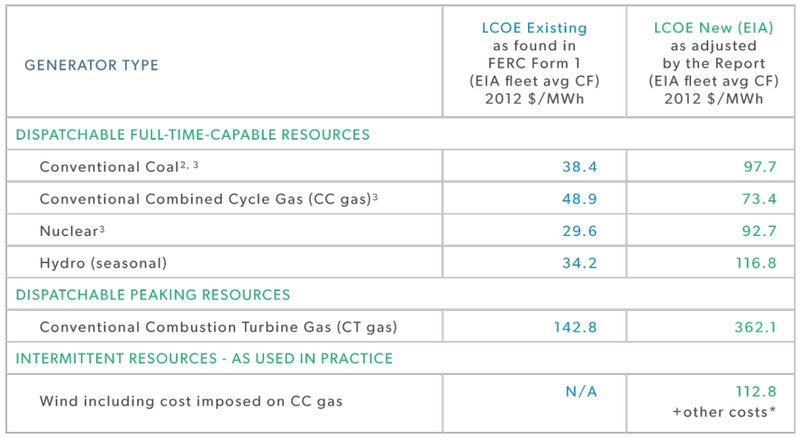 The source of the calculations used in this study is a compilation of data reported by the generators themselves to FERC and EIA.